BRITISH favourites Alistair and Jonathan Brownlee and Spaniard Javier Gomez negated any hope New Zealand's male triathletes may have had to maintain their medal-winning record at the last two Olympic Games. Alistair won the race, Jonathan was third with Gomez slotting in the middle. Bevan Docherty finished 12th, 2m 10s down on the winner with Kris Gemmell 15th, 2:27 back. Ryan Sissons was 33rd, 4:02 back. Courtney Atkinson was the best placed Australian in 18th position. Despite Gemmell coming off the bike first and Docherty not far behind, they had no answer to the strength of the Brits and the Spaniard on a flat course which took little out of the runners' legs and made it into a sprint across Hyde Park. Gemmell was already three seconds down when he left the bike transition. By halfway through the run Docherty was down 1:51 and Gemmell 2:02. Their chances were gone. 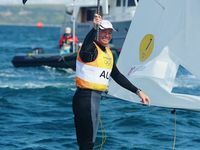 New Zealand has produced gold, silver and bronze medals at the last two Games but there was no answer to the Brownlee power. 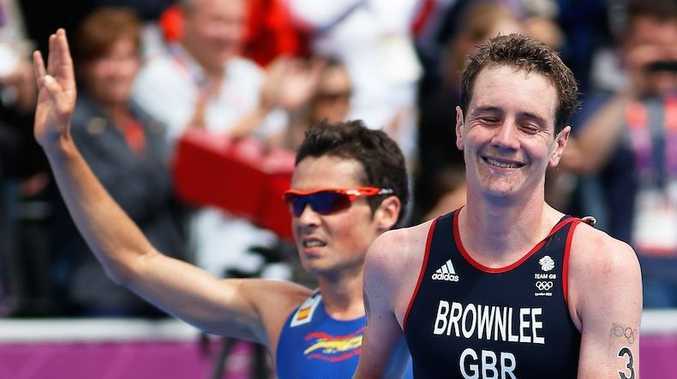 The British script was momentarily threatened when Jonathan Brownlee suffered a 15-second penalty for his transition from the swim to the bike. The umpires deemed he had not put one foot on the ground after the transition point before mounting his bike. 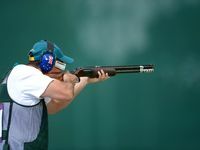 However, Brownlee had established enough of a gap on the two French chasers David Hauss and Andrea Hewitt's partner Laurent Vidal. Earlier, a group of five - the Brownlees, Gomez, Italian Alessandro Fabian and Slovak Richard Varga took off out of the swim to set up a 21-second lead by the end of the first bike lap. In terms of heat it was a blast furnace for contenders to deal with. Gemmell and Docherty slotted into the peloton. Docherty's transition shedding his wetsuit was slick; he looked like he was in a James Bond film as it slid away. There was more of a cat on a hot tin roof look to Gemmell's extrication from the rubber. The peloton caught the breakaway group midway through the second lap, about 15km into the 40km leg. Gemmell and Docherty did their fair share of work at the front to drag the leaders back. No one lost their composure, even with the prospect of a flat course ahead. The flat London course proved a triumph for British triathletes, tourism and spectator viewing as crowds flooded to Hyde Park and the nearby vicinity of Buckingham Palace, Wellington Arch and Constitution Hill.